New York, September 26, 2013 - Global Finance is proud present the winners of the 2013 Stars of China Awards, honoring the best banks and companies in China. The two lists below and a full report on the winners will be published in the November issue of Global Finance, with an in-depth look at the success stories behind the winners and their various approaches to business excellence in the unique environment of the People’s Republic. "In the past year, a new government has taken office in China, and growth is moderating," said Joseph D. Giarraputo, Publisher and President of Global Finance. "The banks and companies being recognized as the Stars of China 2013 have seized the opportunity inherent in this changing environment and are leading the way for their competitors." 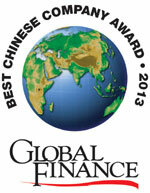 The 2013 Stars of China will be honored at a ceremony at the Westin Beijing Financial Street on November 19th, 2013.